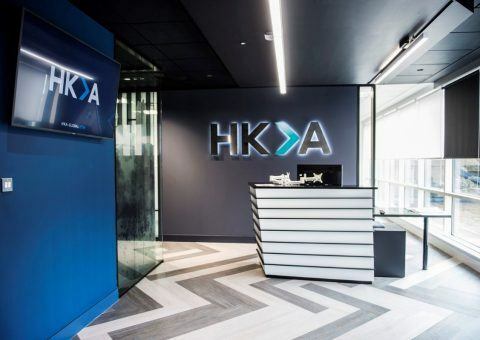 HKA, one of the world’s leading providers of consulting, expert and advisory services for the construction, manufacturing, process and technology industries, launched its brand at an exclusive event held at the firm’s new offices in the heart of Glasgow. HKA is the new global brand that unites the former Construction Claims & Consulting Group of Hill International and associated subsidiaries following its sale and de-merger from Hill International, Inc. Now a privately-owned organisation with management equity, HKA is supported by Bridgepoint Development Capital, part of Bridgepoint, a major international private equity group headquartered in London, UK. Our Glasgow office is the centre of excellence for Engineering, Quantum and Delay Experts providing expert determination, expert witness and expert advisory services throughout the world. David McIntyre, Partner, said: “We are delighted to launch our new brand in Scotland. This is an exciting time for the business as we work together to deliver a seamless and integrated service to our clients around the globe. For over 40 years, we have worked alongside our clients as trusted independent advisers, finding solutions amid uncertainty, dispute and overrun”. “At HKA, we anticipate, investigate, and resolve project challenges. We understand the pressures associated with delivering successful projects, whatever their size and complexity, wherever in the world. We provide the insight that make the best possible outcome a reality for public and private sector clients worldwide,” added David. HKA is now one of the world’s leading, independent providers of consulting, expert and advisory services for the construction, manufacturing, process and technology industries. We anticipate, investigate and resolve project challenges. HKA understands the pressures associated with delivering successful projects, whatever their size and complexity, wherever in the world. As trusted independent advisers, consultants and experts, HKA finds solutions amid uncertainty, dispute and overrun, and provides the insight that makes the best possible outcomes a reality for public and private sector clients worldwide. "We are delighted to launch our new brand in Scotland. This is an exciting time for the business as we work together to deliver a seamless and integrated service to our clients around the globe. For over 40 years, we have worked alongside our clients as trusted independent advisers, finding solutions amid uncertainty, dispute and overrun."